Stem cells come in different types that vary in a key property called “potency”. The more potency, the greater the flexibility of a stem cell to make other cell types. Flexibility in the cellular world is power. The most powerful stem cells generally used are called “pluripotent”, which refers to a special kind of stem cell that can make all 200+ other types of cells in the body through differentiation. Pluripotent stem cells are hard to come by though. One of the more controversial areas in the stem cell field is the notion that the adult body contains pluripotent stem cells. Established types of pluripotent stem cells come in two forms: embryonic stem cells (ESCs) and induced pluripotent stem cells (iPSCs). The notion that adult tissues contain pluripotent stem cells too remains highly controversial. Yet various researchers have reported “adult” pluripotent stem cell isolation from adult breast, marrow, umbilical cord, and fat. One company, NeoStem, is literally banking on the idea that there are adult pluripotent stem cells that they called very small embryonic stem cell-like (VSEL) cells. But the catch is that other labs have generally had far more difficultly isolating and studying VSELs. When it comes to stem cells from fat, typically stem cell clinics and researchers predominantly obtain multipotent stem cells called adipose stem cells, which are mostly mesenchymal stem cells (MSCs). Often this end cellular product made from fat is termed stromal vascular fraction or SVF. These fat stem cells are very useful, but can only make a few types of cells, hence the name “multi-potent”. However, some researchers have claimed that they can get pluripotent stem cells from fat too. Pluripotent stem cells from fat, dubbed by Japanese researcher Mari Dezawa as MUSE for MUltilineage-differentiating Stress-Enduring cells, have garnered more attention because a team from UCLA led by Gregorio Chazenbalk reported in a paper yesterday in PLoS One that they can relatively easily isolate MUSE cells. What exactly are the MUSE cells and how are they isolated? Why have they until now not been more frequently reported or discussed? In Figure 1 from the paper, part of which is shown at the top of this post, the authors have diagramed how they make MUSE cells. 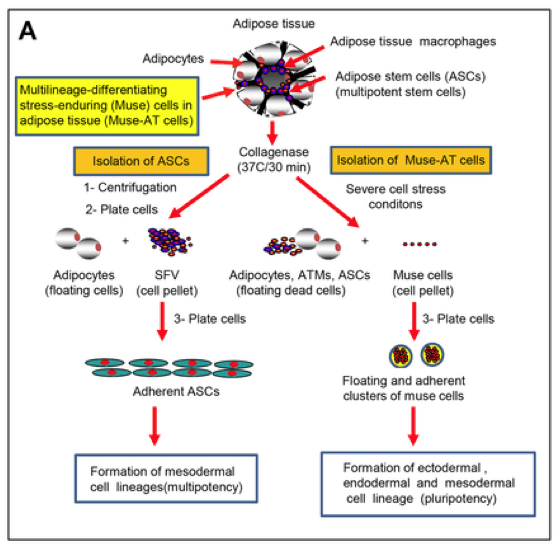 MUSE cells come from liposuction fat samples. Chazenbalk creates conditions of extreme cellular stress that apparently kill all the normal fat cells include MSCs, leaving behind a population enriched for MUSE cells. In fact, Chazenbalk is quoted that he first found the MUSE cells in essence through serendipity when an adipose MSC isolation went wrong and the tissue were exposed to extreme stress by accident. Now he reports he can get them more reproducibly by almost throwing everything at the fat cells but the kitchen (or laboratory) sink: cellular hypothermia, low oxygen, long-term chewing by proteolytic enzymes of the kind in our digestive system, and starvation. It seems a wonder that any cells at all can survive this. The fact that MUSE cells are relatively rare in fat and survive such intense stress when other cells do not could be one explanation for why other researchers have not found and studied the cells. Bottom line? Let’s see whether other groups can recapitulate this work. I remain skeptical about MUSE cells at this time. Thank you Paul for your concise, clear explanation of the challenge to define stem cell potency. I agree that broad scientific evidence is needed to establish cell potential not expected from normal developmental lineages. This is an interesting article and I am not at all surprised. For quite some time, the concept of creating mechanical or chemical stress on cells has been reported. I think the next steps relate to metabolic testing of the cell population for secretory factors. Upon transplantation, I don’t think the cells have much to do excepting cell signaling into the microenvironment. My guess is that the transplanted cells apoptose for the most part in 10-30 days based on porcine work that we have done and what has been reported in wound healing literature. Thanks for the comment, Robert. I think one possibility of what is going on here is that the researchers are creating a new population of stem cells that does not naturally exist through the intense stress that they are putting the cells under. Yikes! Did they really do no genetic analysis to see whether they’d introduced chromosomal abnormalities or mutations? SNP genotyping is cheap and available. And, even I have done karyotyping, all by myself! I would say they should send them to us for analysis, but I don’t want to get involved. Good article Paul. And in plain, understandable language! I don’t know much about Stem Cells and the related research involved, but I think I understood your article. Keep up the good reporting for “us” not-so-knowledgeable. Several thought come to mind with this paper. The first is that if the MUSE cells are truly resting G0 cells, then they would be able to survive the stress; whereas actively metabolizing progenitor and mature cells get killed off. This is like the hematopoietic stem cells surviving 5-FU treatment. The other is how much this is like the “pluripotent” cells from amniotic fluid that also appeared to be non-tumorigenic. The utility and reproducibility of both cell types have yet to be demonstrated.